Posted by Hillary Zhang on 4/19/2019 10:46:08 AM. Audible is one of the top Audiobook platforms around. It's an Amazon company, so you can be sure you’re getting quality audiobooks when you choose to download them. Audible has a large library of audiobooks for you to find, purchase, and enjoy. Some are timeless classics, while others are hot off the press. Science fiction, romance, mysteries, self-help, biographies… there's something for everyone. Besides this, you can listen to audiobooks right on Audible's website, or on Audible apps for iOS/Android. However, the disadvantages of Audible DRM protection far outweigh its advantages. So have you ever thought about backing up your Audible books to make the best use of your paid content? Audible Audiobooks distributed by Audible.com are DRMed AA/AAX files which can be only played on Audible itself, or on specific apps authorized by your Audible account. Even though you have purchased the Audible books, it doesn't mean they are totally owned by you. Due to the DRM protection, you only have the right to listen to the purchased book, but you can’t have the Audible books at your disposal. For example, first and foremost, AA and AAX are not the common audio format, like MP3. So it's very inconvenient to play Audible AA/AAX books on mainstream MP3 player or other music apps; Second, you can’t share your Audible books to your best friends directly or without any limitations; Third, if someday Audible.com no long exist, so will your Audible books. Why not back up Audible books in case something bad or unexpected happened? In my opinion, it's very necessary to back up Audible books in order to take full control of your paid content. In order to get rid of Audible DRM limitation, you must download the Audible books to your computer first. While the downloading method varies in accordance with your computer's OS. 1. If you are a Mac user, things will be much easier. You can download Audible books to your computer directly without installing other application to your Mac. 2. 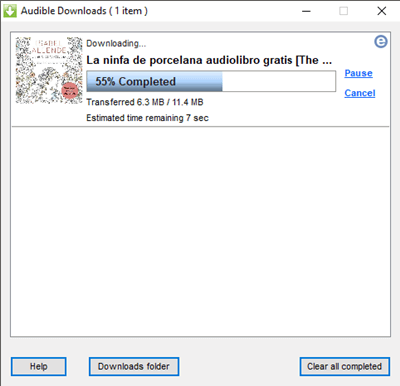 If you are a Window user, you can download Audible books to your computer via Audible App(for Win 10 users) or Audible Download Manager. It's relatively easier to use Audible app to download Audible books to your computer. So we think in this guide it's necessary to show you how to download Audible books with Audible Download Manager. Step 1, download Audible Download Manager to your computer. Step 2, download the purchased Audible audiobooks to your computer. When you click Download button, you will get an .adh file. Tips: The admhelper.adh file is a protocol that assists the Audible Download Manager software in downloading your Audiobooks from Audible website. Then double click the the .adh file to start downloading the Audible books via Audible Download Manager. The prerequisite of backing up Audible books is to get rid of the DRM protection. While the most useful to do that is Epubor Audible Converter which can decrypted AA/AAX books as well as convert AA/AAX to MP3 losslessly with the fastest speed. What's more, it's the cheapest Audible DRM Removal software that can get the best result comparing to other similar software. You can follow the below steps to back up Audible books. Step 1, download Epubor Audible Converter to your computer. Tips: The trial version software can allow you to download the first 3 minutes of the decrypted book. If you are a license user, you need to input the billing email or order number to register it first, then you will get the full content. 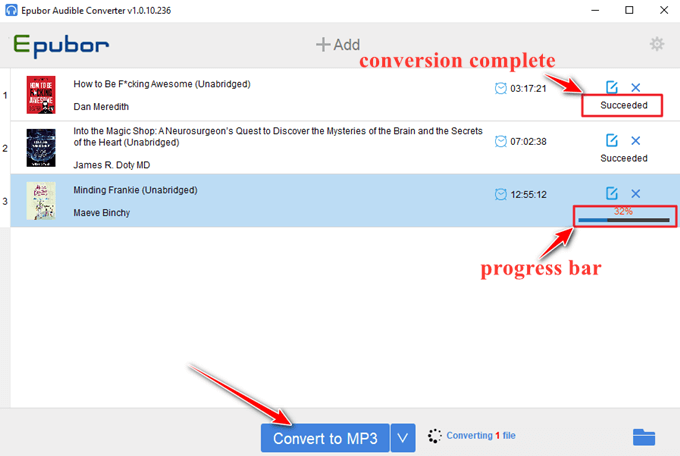 Step 2, drag and drop Audible books to the main window, click Convert to MP3 to start the conversion. As you can see, it's so easy to remove DRM and convert AA/AAX to MP3 using Epubor Audible Converter to back up Audible books. Now you can make the full use of your converted Audible books. Besides Audiobooks, it is important to back up eBooks. Learn more about backing up eBooks.